Throughout my stay was in three different rooms. Some are very noisy others not so bad. Some good food options at the hostel and lively community room. Beds weren’t very comfortable and rooms had a lot of noise from the outside was my main dislikes but overall solid place to stay. Great Wall tour was very good! Fantastic location. Lots of common areas to hang out in. Definitely a go if your not planning on staying in your room the whole time. Rooms clean, plenty of bathrooms. Have stayed here a few times over the last few months. The location and the fellow travelers you meet are the best part of this hostel. Rooms are nice and clean. Front desk staff can be very helpful in asking questions. My only problem with the hostel is the bartender who refused service to myself because I didn't have anything smaller than 100rmb bills. Since this is usually my first stop when I land it china the likelihood I would have anything smaller is rare. It's easier to drink elsewhere. Such an excellent location - lots around on your doorstep. Really smelly toilet / bathroom in the private room we had, which wasn’t very pleasant at all!! Great atmosphere in the common / bar area. Nice hostel, good location. Room were a bit small, but cheap - so value for money was decent. Good bar area & restaurant - I enjoyed my stay! I stayed 1 night at Leo Hostel during a connection in Beijing. The best part is the location - it’s very central on a busy street, and within walking distance to key locations like Qianmen station and Tianamen Square. There is a bar and resto in the hostel - it had a nice atmosphere. The rooms are very quiet. It was not as clean as I prefer but I was only there for a short time so it wasn’t a problem. 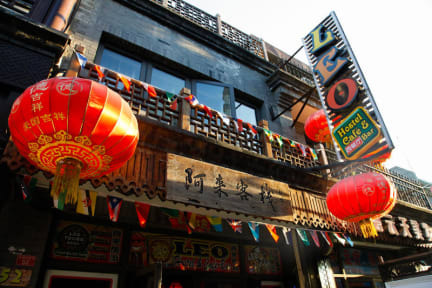 I would recommend Leo if you want a no-frills hostel in a lovely, bustling neighbourhood. My stay at Leo Hostel was simply okay. The rooms are small and the lockers in the dorm are tiny and won't fit large luggage like a suitcase. The beds are very hard. There are no toilets upstairs, only downstairs and the bathrooms all smell. The bar sells food which is alright, but the bar closes around 10PM which is pretty early. There is a hefty deposit of 50RMB per towel. The Great Wall Tour was pretty good, but they book through a travel agent so it isn't them doing the tours- 300RMB/person.